Boston Rob uttered the above quote back in the first episode of the season. Not only is Boston Rob’s advice good in the game of Survivor, it is a decent life mantra as well. Unfortunately for Ralph, he didn’t hear it until it was too late. Ralph went with Sarita to Redemption Island this week to watch the much anticipated duel between Matt and the recently voted out Russell. Overly excited that Russell actually lost, Ralph let his emotions get the best of him. In an obvious position of power because Russell was officially eliminated from the game, Ralph couldn’t resist piling on Russell by bragging about having the immunity idol. Whether Sarita’s advice to Ralph to resist the urge to show Russell the idol was beneficial or not is debatable. The reality is that the damage had already been done for Ralph. Show the idol and he reveals his tribe’s biggest advantage. Don’t show the idol and you look like a fool, which he did. The other problem is that Phillip realized Ralph was lying about not having idol so Ralph lost both sides. At that point, I just wish Ralph and gone through with his boasting and just showed Russell the idol. It would have been nice to see the look on Russell’s face when he realized he’d been out-foxed by a redneck. 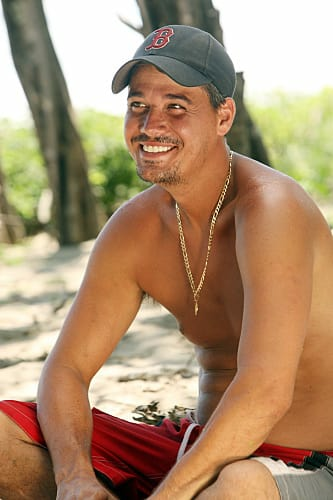 As for Russell, the most unfortunate part about his departure is that he’s likely finally ready to play Survivor. In his first two seasons he benefited from being an unknown and his scorched earth style was unique and unknown. This time around he was nothing but a cancer to his tribe. Might Russell have learned a lesson from being eliminated? Hopefully elimination taught him that playing Survivor is about adapting, not dominating. According to him, we’ll never find out as he is done playing Survivor. That may be the case whether he has a say in it or not. However, if given the opportunity again, I doubt that he’ll say no. His ego won’t let him. So it is that in the second Clash of the Titans, Rob prevails, but perhaps there should be an asterisk next to his win. In All-Stars, Russell beat Rob directly. This time, Rob defeated Russell by adapting to the game. In private, Boston Rob remains as diabolical as ever. His tribe just doesn’t realize it. What a brilliant plan Rob concocted this week to get time near camp to look for the hidden immunity idol. Would Russell ever think of something like that? Sadly, probably not because he’s so arrogant about his own ability to control the game even if his tribe knows he’s looking for it. If he plays again, however, I suspect his approach will be different. Unlike last week, Redemption Island and the events that transpired after it completely overshadowed the rest of the episode. The only thing to take away from the remainder of the episode is how physically outmatched Ometepe is. Despite all of his bluster, Phillip is barely more physical than the women on his tribe. This week’s physical challenge really exposed Ometepe’s weakness. While I was surprised to see it, I had no problem with Russell crying after being eliminated. I was glad to see he actually is emotional about the game, even though he normally hides it. It was too bad his ego got in the way and he had to go off on his former tribe once again before leaving. Can someone please tell me the value of sweeping the dirt floor at camp? Christina is the right choice to send home, but I’m with Boston Rob, I don’t need to see Phillip’s saggy pink underwear anymore either. Ralph’s decision to reveal the idol after all the drama of last week is utterly perplexing. What’s to gain?